Have you ever found yourself constantly working around a problem in your home? One that you wish didn't exist but you feel stuck with for one reason or another? Well, that's how I felt with a few issues in my family room. So, I've slowly been trying to solve them. My number one problem has always been my sofa. It has a slipcover on it (which I like), but it gets messy very quick. I've learned to live with that since most slipcovers (that aren't custom made) get that way. But, what I COULD change were the pillows on the sofa that always seemed to be in piles all over the place! They may have looked neat for the photos on my blog, but trust me, they never stayed that way! 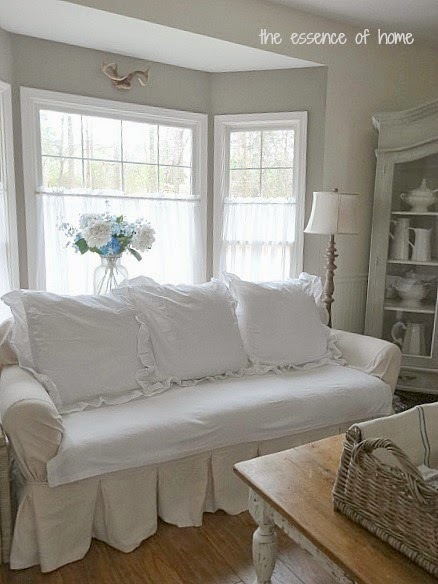 So, when you combined that with the messy slipcover, it would always look disheveled. So, this is what I did. And.........it cost me nothing! I've always loved the look of extra large pillows on sofas as opposed to a lot of little ones lined up. So, I went upstairs to my bedroom and grabbed my European square (26") pillows right off my bed. And, placed them on my sofa just to see what they would look like. And guess what? I liked it! I like that they are big and feel more like a part of the sofa and they come up higher on the back of the sofa which makes the sofa look taller. Since these are a substantial size, I no longer have to worry about a million pillows ending up all over the place. They seem to stay in place better than the other ones. So, once I knew that I liked how they looked, I had to make sure they were comfortable and not too bulky. I sat down, and smiled. Just right! I guess this is starting to sound like the Three Little Bears story now. LOL! My husband gave them a thumbs up too. So, I can rest easy now. He always lets me know if he doesn't like something. Another thing, that I've already shared with you, is the trunk that I placed next to the sofa. It solved a problem too. My tea table was so open underneath and it just so happens to be where all of these unsightly black cords plug in. So, this trunk solved that problem instantly! After we started using the trunk, we realized it didn't have a nice flat surface to place a drink. So, what to do about that? I could always use a wooden or metal tray too. So, now some of my main problems with my sofa and cords showing have been solved. Oh, and by the way, so many of you gave me some great suggestions for what I could place in my basket on my coffee table. I ended up putting magazines in it for now. I have to be careful of things impeding the view of the TV, so I can't have anything too tall. Have you solved any problems in your home lately? I would love to know if you did. Love your baskets. Love the one on the side of the couch and it is great that it hides those plugs. Great solution. Love the pillows on the couch it looks so comfy. I know what you mean about the pillows. Ours are always ending up on the floor. I think you found the perfect solution with the larger pillows. It really does look like they're part of the sofa. I bet it's even more comfortable now too. I also like your idea of using the solid basket as an end table. 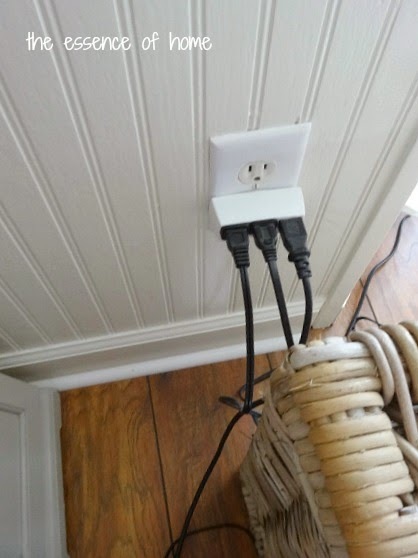 It really makes it easier to hide those pesky cords. I recently painted a cord the same color as my carpet so it wasn't as visible. Lol! You have me laughing at a memory.... a few years ago, I got an off white slip cover for our couch. I think people with kids and pets need slip covers... haha. I had the same trouble... pillows all over, slouchy couch. bah! My solution, same yours... big euro squares! Done!! 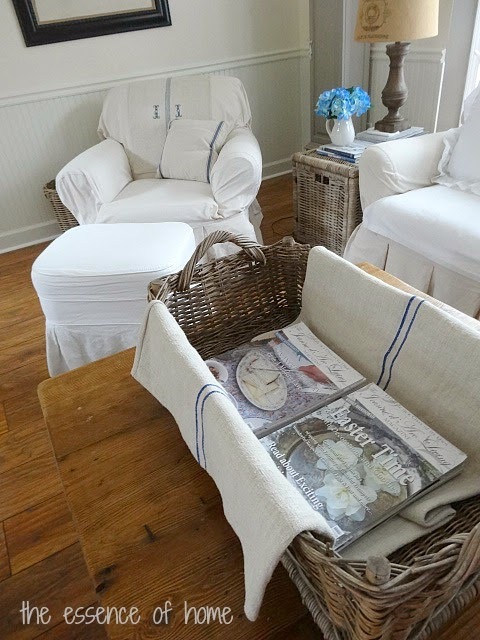 Luv the basket as a side table! Your couch is gorgeous! I have some cord problems right now that I can't even figure out. I try to hide them but they creep back out. Must keep working on it. My problem is floors that need refinishing so that problem will be with me for awhile. My sofa came with four 27" pillows along the back two 18" pillows. I change up the covers on the big pillows frequently. I can't seem to solve any problems around here, I'm much better at creating them. Problems solved! It looks wonderful, Kelly. Kelly, I'd like to know if you could share with me your blog designer. 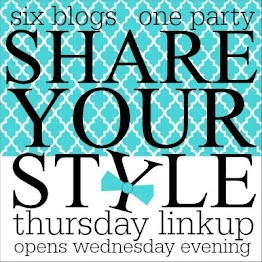 I like the "look" of your blog. Please share. I love pillows too but they drive me crazy. Don't tell my husband because he would just tell me to get rid of them. I love, love your basket!! Hi Kelly I love your home! I also love your new basket. I think the entire basket should show so you can see the shape and texture better! 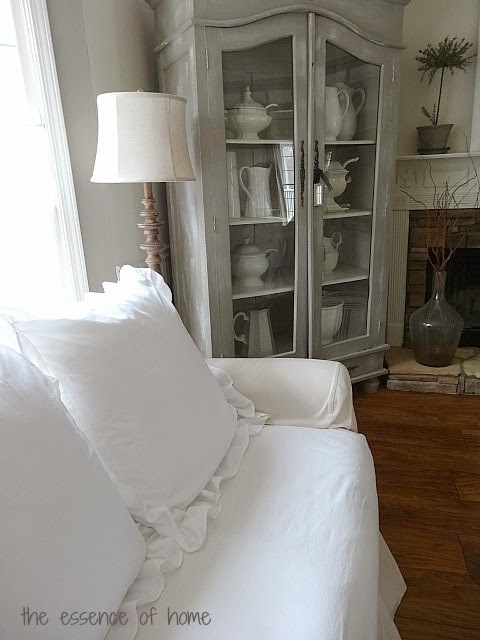 The pillows look like they were made for your sofa...they look great on it!! I can't seem to keep pillows on my sofa, because my Yorkie puppy thinks she needs to take them off...rotten stinker!! The pillows look cozy! My husband tosses off the pillows as soon as he sits down on the sofa. If it were up to him there would be one- for him to rest on! LOL... Electric cords are a pain. I've even blocked them out on a picture because I couldn't stand to see them. That basket works perfectly as an end table and to hide the cords. I have the same issue with the coffe table- nothing too high to block the view- it's practical! I'm working on storage organizing but no new fixes lately! The pillows look great...but what about your bed....?? what did you replace the large pillows with? Funny, but that's the fist thing I thought of..
Love your home..never get tired of your pictures and I keep getting ideas. The basket is perfect for the magazines:) I had to do a cord redo yesterday. I'm not happy with my living room either. We have this hideous recliner sofa. My husband picked out because he said he was tired of being doing second handed stuff. My second hand is better than his first hand. He hates it now and I abhor it! I'll be looking for something else for sure. Kelly, The pillows are beautiful on your sofa! Love the basket too. Trust me, you don't want to hear about my decorating problems, (unless you have a few hours to spare). I love your solutions about the pillows. 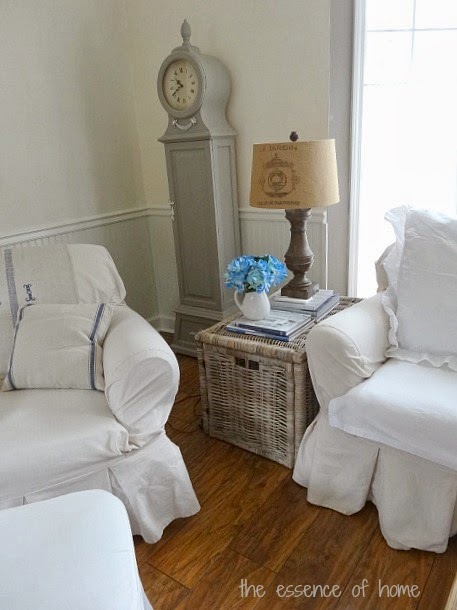 I think I have the same slipcover on the porch, and yes, they do tend to look disheveled after a bit of use, and like you I'm not a huge fan of lots of pillows. I'd rather have a few larger ones that make a statement, and I think your pillows are lovely and look fabulous and comfy. Cords are on my 'I would like to punch the inventor in the face' list. Hate them! It's one of the reasons I don't like glass side tables if they're going to house lamps. You came up with a lot of solutions!! I like the Euro pillows on the sofa...just perfect. I never used toss pillows until my kids were grown, I was so tired of how sloppy they looked or how they ended up on the floor. The wicker end table is so great, I love natural things like that with white slipcovered furniture, your basket on the coffee table, too. I had to laugh, hubby cautions me not to have anything over 5 inches high on the coffee table because of the TV! Ha! 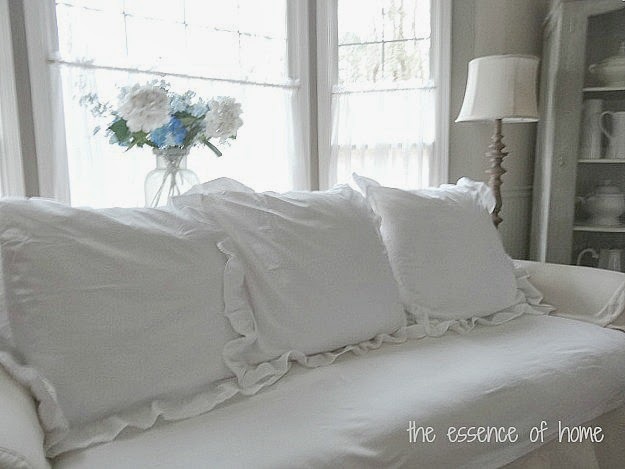 I never would have thought to use the Euro pillows -- brilliant idea! They actually look like they are part of the sofa. And you can buy different shams to change the look. It's a pet peeve of mine to see wires, but sometimes there doesn't seem to be a solution. Glad you found one. I have a bunch by the wall unit in my Family room...I should get a plant, or stack up some books! Kelly, you are the ultimate problem solver! The pillows look great on the sofa; and the trunk is a wonderful way to hide those cords! Love the basket on the table, too! Don't you just love it when you have an epiphany?!! The shams are perfect on the sofa!! !..you have solved so many of your decorating dilemmas ...Still trying to solve a way to hide those lamp cords! In my next house, I am going to place the wall outlets in the baseboards!! your decor looks so fresh and clean. love it. I prefer large pillows over a bunch of little ones too!!!! They look great Kelly!!! Love it Kelly! I have pillows that size on my couch now too. Someday I want a deeper sofa so they pillows don't make it too shallow to sit on comfortably but we just smush them around and move them till it's comfy. And when I want to straighten up it's only 3 pillows to plop back in place. My problem room that I can't do much with is my kitchen. It needs a complete gut and redo! All the appliances need moved to make it more efficient but that's not something I can do on my own, easily, or cheaply! You could always put a piece of glass on the trunk..Love the pillows..
Just perfect and comfy too! It looks like you've got everything in order, Kelly. I love the baskets you've added to the room. I'm afraid it would take a team of experts to solve all the decorating dilemmas in our house! 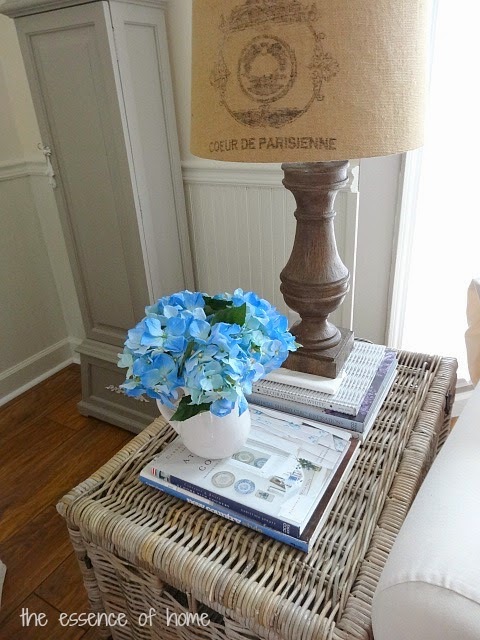 Love the textures that the baskets bring to your pretty room. Oh I hate plugs too...but we need them.Love how you disguised yours! Your sofa looks amazing!